Hero Wouters is a Dutch artist who has been active since 1950. Through the years he has been involved in many (music) projects. His work in the field of electronic music ranges from synthpop to experimental music. Some people might know him from his collaborations with The Legendary Pink Dots and Edward Ka-Spel. Other people might know him from his contributions to the obscure Contactdisk vinyl series or his appearance on the legendary Dutch Ding-Dong tape label. 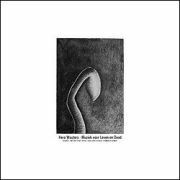 Featured on this LP is work by Hero Wouters from 1982, 1984, and 1986. Most of the material was written for a Dutch film (‘Een zaak van Leven en Dood’) and a theatre play (‘Laios’). The music has been (partly) released on cassette on Hero’s own label Herophone. Now it is for the first time available on vinyl. The music has been restored from the original tapes and mastered for vinyl with great care not to loose the original feeling. Below you can find soundclips for the tracks but we feel these do not give a really good impression of the record. The music (and the record) have to be heard in total (and as a whole) to be fully experienced and appreciated. We are proud to present this beautiful and simply fantastic music by a Dutch artist that deserves more attention. The wonderful cover artwork is a drawing by Maaike.